What questions do you have about KickSmart Swimming? What age should I start my child in swim lessons? You are never too young or old to start swimming! We teach as young as 6 months old, using playful techniques for water acclimation and safety skills.Each stage of child development requires different techniques and tools. With our adolescent and teenage learn to swim students, we love teaching about the science of swimming and aqua dynamics. All of these techniques help engage the swimmers and help them fully understand how their body moves in the water. How long will it take for me or my child to learn to swim? There is no definite time in which you or your child will learn how to swim. It will depend on the swimmer’s desire, abilities and confidence. Some swimmers take to the water right away and pick up skills very quickly. Others are very hesitant, but with patience will learn the same skills in a slightly longer period of time. 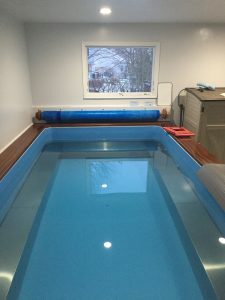 An Endless Pool is a small swimming pool with an adjustable current for swimmers to swim against, and is sometimes referred to as a treadmill for swimmers. The adjustable level of difficulty makes an endless pool suitable for people at all levels of swimming ability. Most private and semi-private lessons are 30-minutes. Some of our clients choose for a 60-minute lesson if they are competitive swimmers or coming from a distance. How are you able to work with people who have unique needs? We always say that every person has unique needs and ways that they learn. We use tools such as schedules, props, pecs, and a lot of patience to help swimmers learn through hearing, seeing and feeling learning styles, Our instructors use tactics to help swimmers stay on task and focus during their lessons. To register, please contact our owner, Barb Seiden, at 267-218-3798 or info@KickSmartSwimming.com. She will collect your information and coordinate scheduling your lessons with your instructor. Is there a place for changing at the indoor pool? Our indoor pool has both a changing tent and restroom. When will I be able to start my lessons? We can start your lessons as soon as you and our instructors are available. You work directly with your instructor to customize you scheduled dates and times for swimming. Should I stay in the pool area during my child's lessons? You have the choice to stay in the pool area during your child’s lessons. We like our parents to see their child’s progress, but understand some parents may choose not to distract their child during lessons. We have a seating area and toys for siblings to play with during lessons. Why do you only teach private and semi-private lessons? It’s proven that lower student to teacher ratio is the best situation for learning. With private and semi-private lessons you can move at your own pace and receive individual attention. Each lesson is customized for your learning style, developmental level and specific needs. In addition, our instructor’s love the bonds they create with their swimmers and their families, which help to build trust and comfort in the water. Semi-private swim lessons offer swimmers the opportunity to interact with another swimmers of a similar age and ability, while still receiving personal attention. Both swimmers are encouraged to observe one another and remain active throughout the swimming lesson. Our families who choose semi-private lessons swim with their siblings, friends or spouses. Are there any specials if I buy multiple lessons at a time? We offer a special of buy 15 lessons and get 1 free with private and semi-private lessons. How do I pay for lesson? We accept cash or check (made out to KickSmart Swimming). All year round we teach at a home indoor Endless Pool in Doylestown PA. During the summers we also teach at Tohickon Valley Park Pool in Point Pleasant PA and at home pools in Bucks and Montgomery Counties. What happens if I can't make a scheduled lesson? We have a 24 hour cancellation policy – we must receive at least 24-hours notice if you need to cancel or reschedule a lesson. We do our best to reschedule lessons if there is availability, or we can postpone lessons till the following week. All of our fabulous instructors have years of experience teaching swim lessons. Yet, we know that swimmers can form bonds with their instructor. We do our best to coordinate your schedule with your preferred instructor. There may be times an instructor is unavailable to teach your lesson, so we may offer to have a substitute instructor or reschedule your lesson. What should I bring with me to my lessons? Please bring a bathing suit, towel, goggles and swim diaper (if needed). We have extra goggles you can borrow too! If you or your child have long hair, please pull it back with a hair band. What is the Participant Release Form?